This page shows how to create a “commercial” multi year cash flow. For a chart of cash flow methods and property types, see Create multi year cash flow. 1. Click the Underwriting tab and the DCF Assumptions sublink. Note: Each configuration of Backshop can be different. Underwriting functions might be under the Property tab. Multi Year Assumptions might be called DCF Assumptions. 2. Verify that the correct property and underwriting are selected in the menus. 3. Enter the number of years, which is required. Add more if you like. You can always come back. 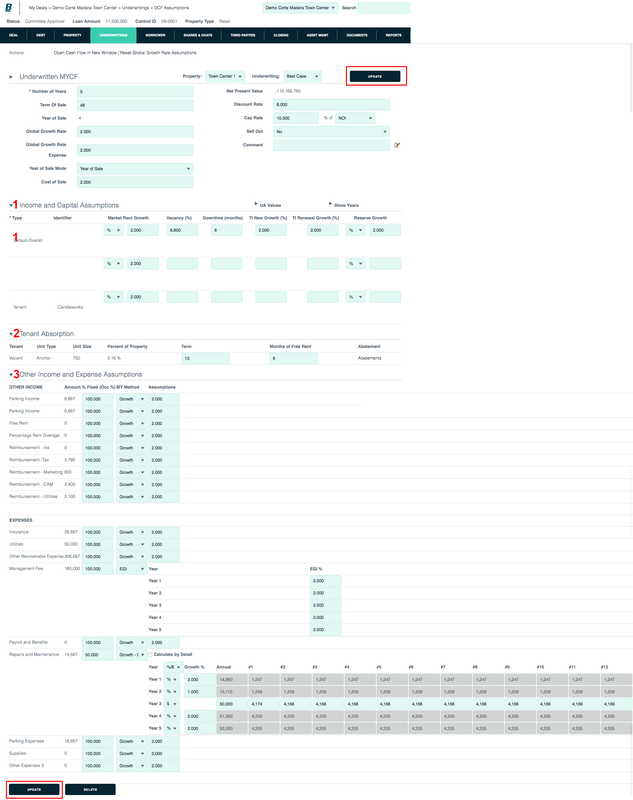 After you save your stabilized cash flow assumption, more settings become populated and available. 1. Income and Capital Assumptions: Grow/adjust lease level assumptions from the stabilized cash flow. 2. Tenant Absorption: Vacant space will be leased based on the Term. 3. Other Income and Expense Assumptions: Can be percent of EGI, straight growth or custom growth. Review and/or edit the settings, then click the Update button. You can always come back. 1. To open the multi year cash flow in the same window, click the DCF (NPV) sublink in the main navigation. 2. 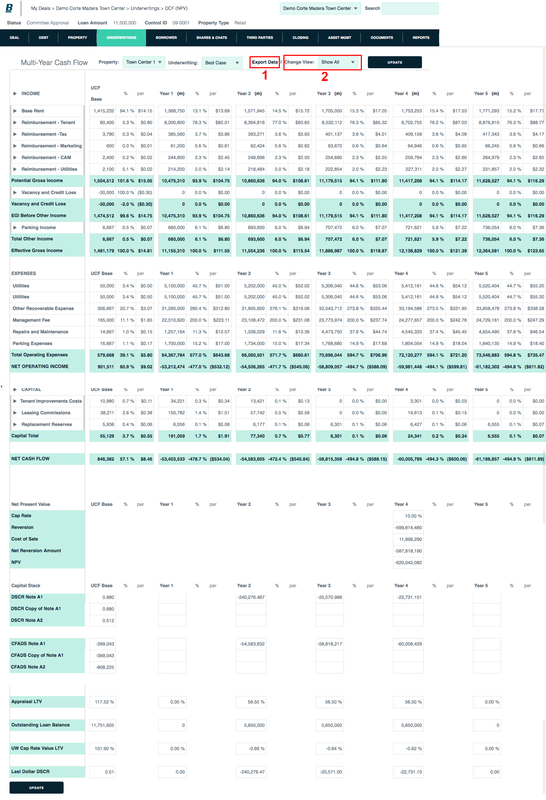 To open the multi year cash flow in a new window, click the Open Cash Flow in New Window link. Ideal when using multiple computer monitors. Here is the “commercial” multi year cash flow. 1. Export the multi year cash flow to Excel.